If you are lucky enough to live near some fun family attractions such as fun centers, museums and amusement parks, you probably have kids that want to visit these places frequently. Paying full price each time you go can get expensive, and season passes seem to be pretty high in cost too, especially for deluxe packages. Here are some tips for saving money on season passes for the attractions near you. Ask about discounts for locals. Many parks offer special pass discounts for people who are within a certain mile radius of the park or attraction. This could be a large discount, or a small one, but why pay more if you don’t have to? Check out local wholesale clubs for discounts and deals. Places like Sam’s Club and Costco often offer discounts on season passes in the local area. They sometimes ask that you buy more than one, but this can still be a great discount. Ask for corporate discounts. If you work for a large company, especially if it is local, there may be discounted season passes available to employees and their families if they are bought in bulk with others you work with. Get your passes before the season opens. By purchasing before the season opens, you are likely to snag early bird passes that can be discounted up to 30% off the price if bought when they are open. Look on the attraction’s website for more details and see if there are offers available. Take discounts for referring others. Some places offer discounts to pass holders that refer others to buy them. Make sure if you send someone their way that you ask that person to include you as the one who referred them to take advantage of this deal if it is offered. Renew your pass from last season. Sometimes, you can get a discount for being a past season’s membership holder when it comes time to renew. Buy passes in the fall for next year. This is not so much a tip for now, since it is spring, but keep it in mind in the fall when you decide to get passes for next year. Check on websites like Craigslist for others selling their season passes. Sometimes people buy season passes thinking they will use them and figure out they won’t be using them because they are moving or have plans change. This is a good tip for you if you decide after the season opens that you want a pass and now the prices are higher. Just make sure to meet with the person to make sure they are valid before you buy and that there are no exclusions on it being transferred before you do this. Buy your passes online directly on the attraction’s website. You may be surprised that you can save 5-10% just by doing this. It’s not a lot, but it’s not full price either. Sign up for emails from the attraction and follow them on social media. You will be alerted to new sales that come up for holidays and early bird specials as well as the possibility to even win season passes for free through social media. Do you have a favorite tip to save on season passes to attractions? We would love to hear it in the comments below. Great tips. We do check our warehouse store for discount and bought them early one year. We didn't end up going that much so we need to figure out what places we LOVE to actually make them pay for themselves. These are some really great tips! I've never thought of looking on Craigslist before but I'll definitely try that in the future. It's so hard to save money on season passes especially when tickets go up every year. But thanks for the tips! The buy passes early is a great tip. 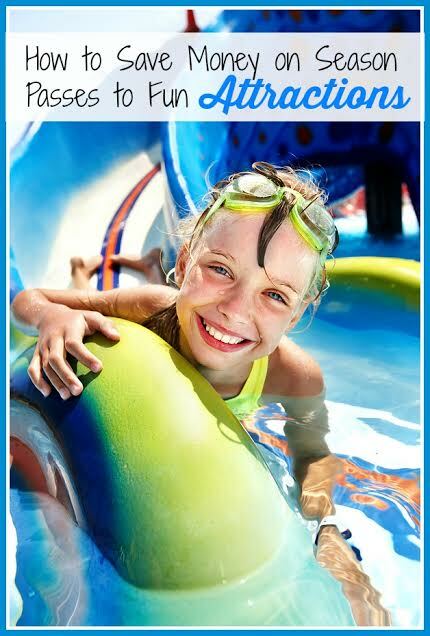 We always did that for the local water park - bought our passes in December for the next year's summer - we saved a bundle that way! These are all great tips. Especially the craigslist one! These are all great tips and I often do search online for the best offer but some of these I don't do thanks for the ideas. Great tips, I'm going to try these. Those are great tips. We have passes to our local aquarium and a few other places around town. They give great deals & we have figured that going just twice throughout the year often covers the whole cost. These are all great tips. Thanks for sharing them. I didn't think about buying second hand. It never would have occurred to me to look for secondhand passes. That would save a ton of money! We bought season passes to Dollywood this year and I'll try to remember to renew before they expire. I used to have season passes to Busch Gardens and Adventure Island. I'd love season passes for Disney. These are great tips, we used to have memberships at the Botanical Gardens, zoo and museums, but now that we have Hulk (my kids name all the cars) we can go back!